Hi! and thanks in advance if anyone here can decipher the mark on the bottom of this pot! I had to resize my pictures so very tiny to make them close to the 100 KB requested size limit here. I uploaded larger pictures on my Google blogging space, so anyone who needs more close-up details can go there and click to enlarge. The vase is 5 inches tall. Crackle glaze. 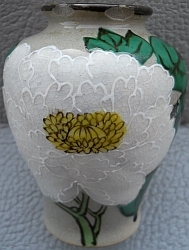 Squeeze bag tube lined enamel decoration around the white peony. 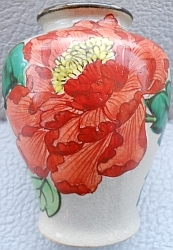 Heavy, thick brush applied outlines around the red flower and the leaves. It has some bad chips on the rim, so I can see that the clay is fine grained, a grey-ish color and it's very hard like stoneware. 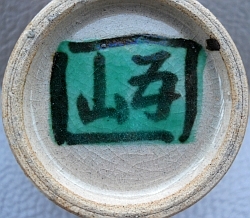 The mark is only two hand painted characters inside the outline of a green rectangle. 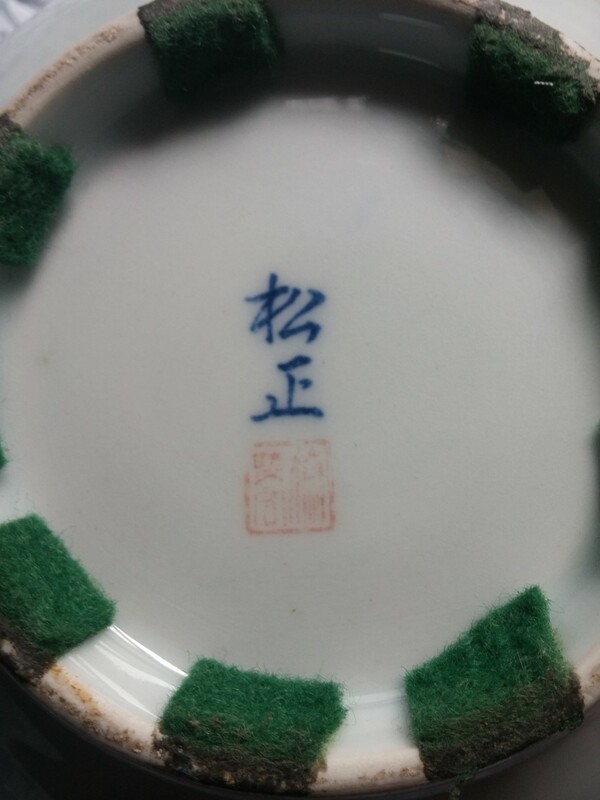 I started out thinking it is Japanese, but haven't been able to find the mark anywhere, so have looked at Chinese marks, too. And I have scrolled through hundred and hundreds of marks! It's posted at this link since last September with no definitive replies (better pictures, too). Keeping my fingers crossed! Thanks again! Link :Click to enlarge pictures can be seen here at my Google blog space. I think your vase is Japanese Kyoto ware, possibly early 20th century. Sorry I can't read the mark for you. On second thought the mark looks like a monogram, 'LZT'. So maybe not Japanese after all, although it sure looks like a Kyoto piece. Thankyou Robert for your reply. I'll look at Kyoto ware and see if I can find anything similar. 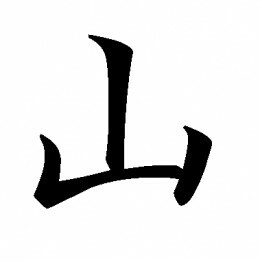 I think I've figured out that the character that looks like an upside-down 'T' is the Japanese symbol for 'mountain'. I keep seeing it in Japanese and some Chinese maker's marks too. I've seen marks inside square-ish borders are called a Fuku Marks. Hopefully I'll be able to figure out what the 'Z' conjoined with the curved mark means, if someone here doesn't recognize it.